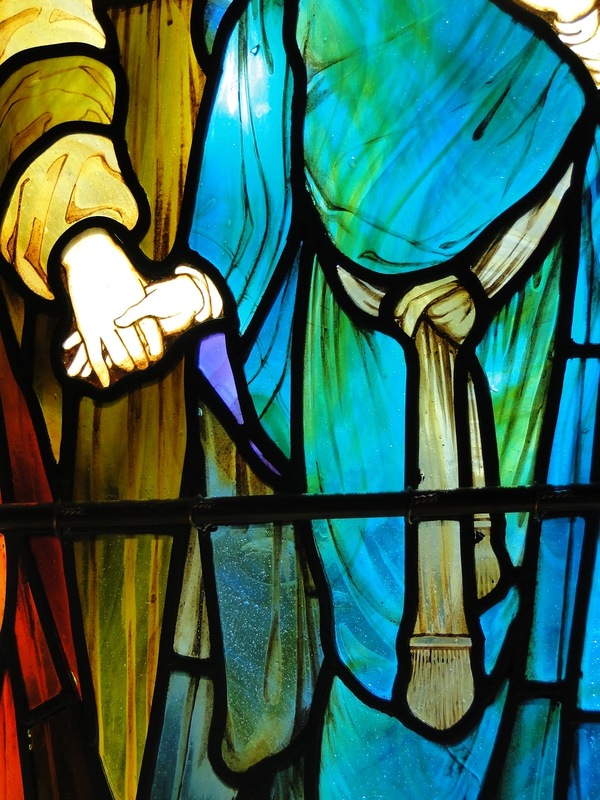 For years, this image from a Scottish church has intrigued and inspired me: Jesus holding the hand of Mary Magdalene, their heads inclined slightly toward one another, her left hand over her heart. There is an intimacy to it, a softness, which radiates love. The intrigue comes from the details: the somewhat unusual way in which Jesus holds her hand, the tying of her sash underneath what appears to be a swollen womb. I have studied the legends surrounding Mary Magdalene in Europe for two decades on four continents. On this journey to understand the real woman behind the legends, I have viewed thousands of images of her. This one is special. And for the same amount of years, I have read interpretations of the window and its intended meaning. There are often vitriolic arguments about what this window actually depicts, and how and why conclusions are drawn. Sadly, where Mary Magdalene is concerned, there is far more vitriol than harmony online and certainly in discussion forums. This has influenced my research over the years, causing me to be extremely diligent before committing details to writing. I am by no means a skeptic, but I do have certain standards for accepting evidence. This can be tricky when dealing with folklore. The very nature of folklore is that it is something cherished and often hidden or protected by the communities from whence it evolves, so how do we determine if and when legend can be accepted into the record? The answer is: discernment. We have to be discerning in terms of what evidence and which legends we accept as our source material for reconstructing history. For some, the details of who Mary actually was, her factual/literal history, do not matter in the slightest. Mary Magdalene is a spiritual icon, alive in their hearts in a form which has meaning for them. Although I have this same emotional attachment to her legacy, I also have a researcher’s responsibility and drive to investigate the facts. This week, I finally had the opportunity to get out to the Isle of Mull on the west coast of Scotland and view this window in person, as well as the beautiful church which contains this and six other stained glass windows by a master of his time. - The window is one of seven in Kilmore Church in the village of Dervaig on the Isle of Mull. 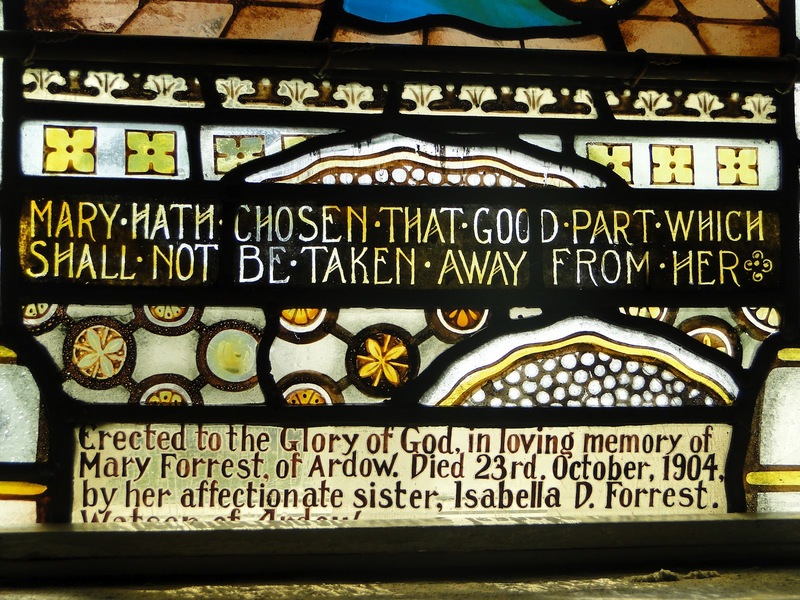 - The window was commissioned by Isabella D. Forrest, in memory of her sister Mary Forrest, who died in 1904. There is an inscription at the base of the window which tells us this. - The artist responsible for all of the windows in Dervaig was Stephen Adam, a renowned Scottish stained glass artisan based in Glasgow. Adam was highly respected and accomplished in his day, and his services would likely have been out of the financial range of a small community in such a remote location under normal circumstances. Much of his work was commissioned in larger towns by wealthy patrons. But his wife was from Dervaig and they were married in the old Kilmore Church in 1887. These windows were created from 1904 to 1910 with the construction of the new church. Stephen Adam died in 1911. The above constitute the facts, what we know indisputably about this window. Where we take this in terms of interpretation is another matter entirely. 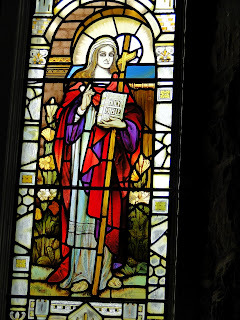 There is a fair amount of disinformation regarding this window online, so I would like to address what I believe are some of the fallacies both for and against the interpretation of the Mull window as a pregnant Mary Magdalene. My ultimate conclusion follows. It is often written online that Kilmore means “Mary’s church.” As much as I would like that to be true, it probably isn't. This fact occurs in the records on Kilmore – not just for this village, but for the many places in Scotland and Ireland named Kilmore. It simply means Great Church or Big Church (“cill” means church, “mhor” means great). Now it may seem that I am nitpicking here, but this is why: when we continue to perpetuate little errors like this, it gives the real skeptics (and those with an agenda to lessen Mary’s importance) ammunition against our case. The majority of websites and discussions I see about this on pro-Magdalene sites repeat the Kilmore error, immediately diminishing credibility for the rest of the argument. I want to strengthen the argument by looking at what is true. It has also been written that the nearby town of Tobermory means “Mary’s Well.” This one is true. It is a common enough name, and there are hundreds of ancient holy wells, once devoted to mother goddesses, which were Christianized and re-named as "Mary’s wells" throughout the Celtic lands. Thus it is likely that this has been a place where Marian worship of one kind or another took place. In my community we call this "Mary a choix" - the Mary of choice - because it can refer to the mother of Jesus or to Magdalene or both, depending on the tradition with which you are aligned. 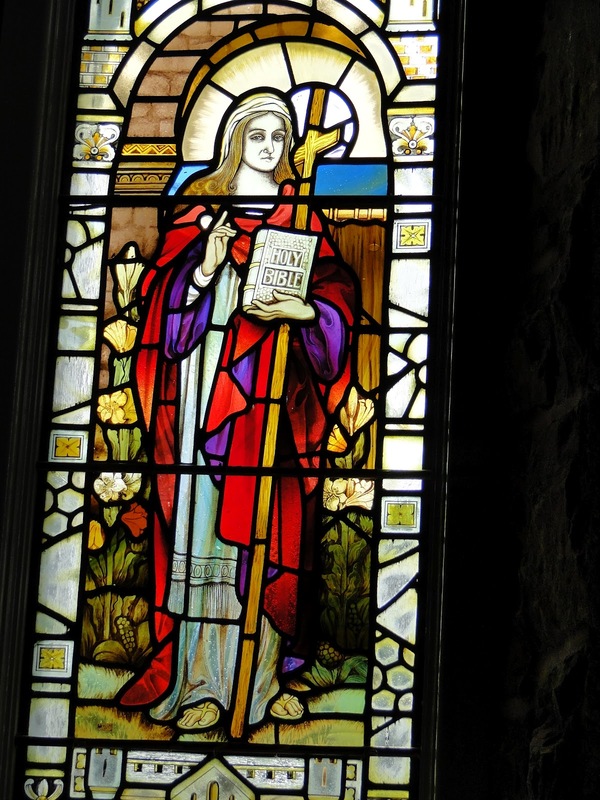 Because of the close relationship between Scotland and France, and the understanding that those persecuted as Cathar/gnostic heretics fled France for refuge in Scotland (and other places), it is certainly possible that there may have been a center of Magdalene devotion on Mull. In a future book which I hope to write about Rosslyn Chapel, I will go into this history in great detail. (Note: The difference between the translations of Kilmore and Tobermory is the second syllable at the end. Tobermory comes from Tobar (which means well) and Mhoire (in Gaelic this is pronounced Mweer-ah, and it means Mary). Kilmore doesn’t have that second syllable, and is therefore Kil (church) Mhor (Great). I have read arguments by skeptics that the woman in the window is meant to actually depict Mary Forrest herself. As someone who has been researching stained glass for 20 years, I can state that this is highly unlikely. It was common in stained glass memorials to depict a saint who was the namesake of the deceased loved one. In this case, Mary Forrest is represented by Mary of Bethany. We don’t know much about the life of Mary Forrest, although we do know she was never married and lived with her sister and her husband until her death, and it is recorded that she was known for her doll collection and her talent at needlework. I have tried to find her and her sister in the genealogical resources of Mull to determine her age at the time of her death, but to no avail. I did find one reference, but when I attempted to access it, it had been deleted. It could be that her extended family or descendants removed it because they were tired of dealing with post Da Vinci Code investigators on the subject. But if anyone reading this has firsthand knowledge of the Forrest/Watson family who can shed more light on the subject, please let me know. In the same tradition, three windows to the right of Mary is another creation by Stephen Adam. Depicting Elizabeth of Hungary, it was created to memorialize the matriarch of a local family, Elizabeth Chalmers, in 1905. 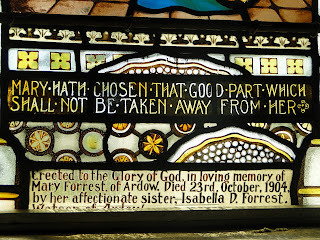 I have found several more gorgeous memorial namesake windows by Stephen Adam of this same nature. So I think we can easily rule out that the image was literally Mary Forrest. It is possible that the features and coloring of the Mary in the window may have been created to reflect those of the deceased woman, depending on whether or not she was known to Adam and his wife (which would account for Mary Magdalene being unusually depicted as a blonde). Did Mary Forrest’s sister, Isabella, choose this depiction of Mary of Bethany and this quote because of the relationship between Mary and Martha? Was theirs a "Martha and Mary" sisterhood, with Isabella playing the married, domestic Martha role to her unmarried, younger sister? Did it have some kind of personal meaning for the family, outside of the obvious namesake connection? We cannot know this unless there is a descendant of the Forrest family who wants to talk about it, and thus far I have not been able to track one down. But it is a theory not without merit. The biblical quote, cited in a more complete form above, is from the gospel of Luke, Chapter 10, when Jesus has come to teach at the house in Bethany. Martha is in the kitchen, while her sister Mary is on the floor, at the feet of Jesus with the other disciples, listening to him teach. Martha is complaining that Mary is listening rather than helping her in the kitchen, and Jesus admonishes Martha with this quote. We will deal with the extraordinary and often overlooked literal meaning of the quote in a moment, but first we have to take a quick look at this idea of “the two Marys.” There is a centuries-old, intense argument about whether or not Mary of Bethany and Mary Magdalene are, in fact, the same person. The nature of that debate is outside the scope of this particular blog post, but the quick version is that the Catholic Church accepts that there is enough evidence to declare that they are one and the same, with which I absolutely concur. The well-preserved French tradition, which can account for the relics of Mary, Martha and Lazarus is very specific on this - there is only one Mary, and she is Magdalene. The ancient church of St Martha in Tarascon, Provence, provides exceptional proof of this, with ancient monuments depicting Magdalene and Martha together as sisters. A number of churches in southern France have chapels, statuary and windows depicting these traditions, wherein the three are referred to as the Bethany Trinity or the Provence Trinity, in reference to where they first preached after the crucifixion. The photo below is taken in the chapel of Sainte Baume, one of the sites where Magdalene's relics are preserved and it is believed she lived for some time. It shows her primary, flanked by Martha and Lazarus. This one is more modern, early 20th century, but there are more ancient ones as well (which I do not currently have handy photos to post with permission. I took this one, below). Differing traditions, including the Orthodox, actually celebrate three separate Marys. But I believe beyond any doubt that there is overwhelming evidence for them as the same woman, and we will work from that point of view. Also, and this is important and usually overlooked, in the gospel is she is not identified as “Mary of Bethany” – that is an assumption made in later traditions. It simply says “Martha and her sister Mary.” In the 16th century, a small fortune was spent by a French noblewoman on this question, as she brought in theologians from all over Europe to argue the issue of how many Marys existed. Another question I have always had with this window in terms of identification is the color of Mary’s dress. Magdalene is generally shown in red and green – although this is not a hard and fast rule, particularly with more modern images (19th and 20th century) as these are. 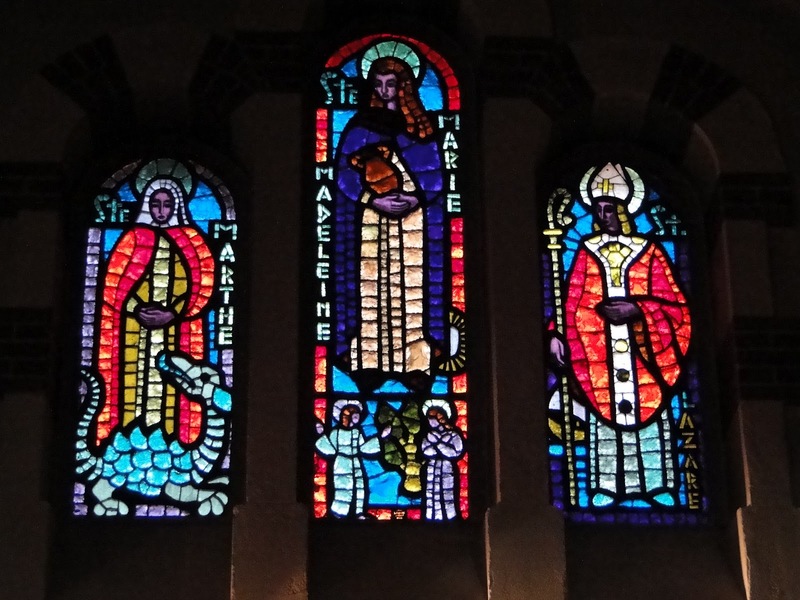 Some of the Sainte Baume windows, for example, show her in blues and purples. 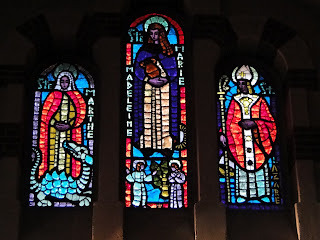 Every image I had ever seen of the Kilmore window appeared to depict Mary in a virginal blue. However, in person, her dress is artistically swirled with green through the blue, even with touches of purple, and appears to be a case of artistic license to contrast her with Jesus who is shown with a red cape. When it comes to identifying Magdalene in art, color can matter, but it doesn't always - it is often tied to the era when the work was created and can simply be an artistic choice. The great debate with this window has always been and ever shall be: is she or isn’t she pregnant? Skeptics say that the image may just be of voluminous draping in keeping with the Greek revival style that artist Stephen Adam and his mentor, Daniel Cottier, were adopting at the time, and is therefore not of a pregnant woman. On this, I stringently disagree. The artist himself seems to make a strong contrast between the image of Mary and that of the other female he creates for this church (see photos above). His Elizabeth image is depicted with a dress that falls straight from the waist. Further, I have investigated every female image created by Stephen Adam that I can find, and also many created by his teacher and mentor. There is no other female image created by this artist depicted in this way. Although Adam does at times show folds of draping fabric, these are always with an empire style waist, and not in a way that accentuates the abdomen as this image does. Then there is the issue of the hands. This pose is also unique, and I challenge anyone to try to find a pose that duplicates this anywhere in art, but certainly not in depictions of Jesus! The intimacy is certainly striking, but my attention was also brought to the position of their hands – they are not standing side-by-side, but rather they are standing in such a way that their right hands can be joined together. In the ancient Celtic marriage ritual known as hand-fasting, more prominent in the Scottish isles than any other place in history, it was the right hands which were joined together. In early versions of this ceremony, cords were not used, and the couple was joined with a vow and the clasping of their right hands together. Thus we have island people, from island traditions, using a symbol for marriage and/or commitment which would be easily recognized by “those with eyes to see.” I do not believe this was a coincidental choice. Stephen Adam came from the workshop of Daniel Cottier, who was heavily influenced by the work of the pre-Raphaelite artists, specifically Rosetti and Burne Jones. Both of those artists are renowned for their passionate images of the grail legends and the surrounding mysteries, and by default this would have had an impression on Stephen Adam. 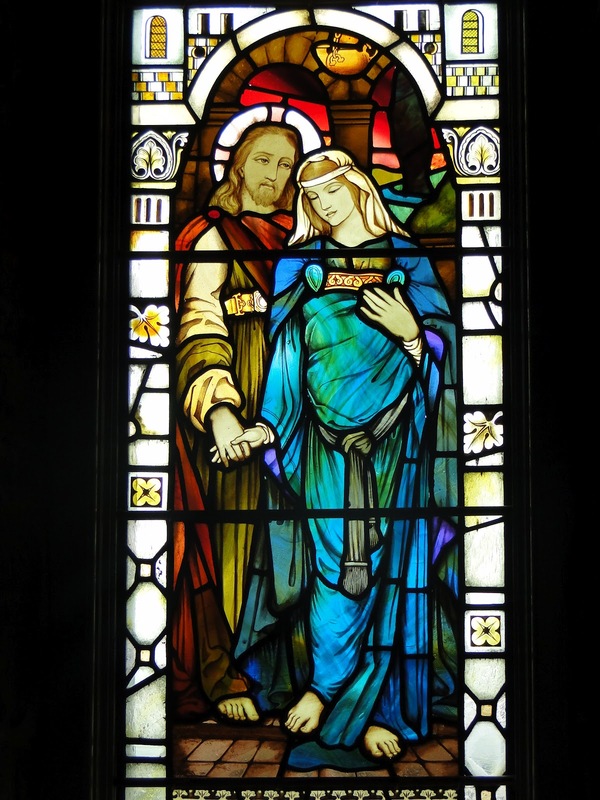 But is it Mary’s potential role as the wife of Jesus, or even the possibility of a depicted pregnancy, that are really the most important element of what this window has to tell us? For me, all of that is secondary. My interpretation of this sequence is that Jesus is showing Martha that Mary has chosen a path that is higher than the traditional role in which most women were kept. She has chosen the path of higher spiritual learning, of study, of devotion. Spiritual over material. Mary is exalted for these choices, and for having the courage to make these choices - because Jesus emphasizes that “Mary has chosen.” This, more than anything else in the gospels, shows definitively that Jesus included women in his ministry and his community in an honored and potentially equal way. And if the literal interpretations are correct, Jesus was also advocating for women disciples as a “vocation.” Now that is exciting, and certainly a challenge to the modern Catholic Church which recently and shockingly equated the ordination of women as a sin equal to that of pedophilia (author's note from 2016: this was written in 2012, shortly after a Vatican official had made that statement). In my novel, The Expected One, I told the story of Mary Magdalene from the point of view of the French traditions in the way they were taught to me. Although that book received international attention for its controversy – my detailed depiction of Jesus and Magdalene as married – for me, this focus missed the ultimate point of the storytelling. It was Magdalene’s importance as the “apostle of the apostles” as the courageous woman and partner who walked beside Jesus and ultimately became his successor which matters to me most of all. The Gnostic Gospels give clear evidence of this, as do the French traditions. 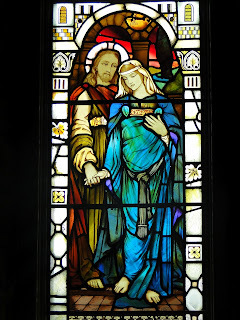 Yes, I do believe that Jesus and Magdalene were married and had children, and yes I believe that she is pregnant in the Kilmore church window. What the artist and the client ultimately meant to depict may remain a mystery, but for me, this image of the love and partnership of two exceptional teachers and leaders remains deeply inspirational.